Denny Jump (Bellevue, WA, United States) on 8 October 2010 in Landscape & Rural and Portfolio. This round rock is supposedly one of several in the park but I have only seen this one. It is located in an area called "Jumbo Rocks" which is a delightful area with a campground (bring water) and easy nature trails. The Park actually has several delightful but very basic campgrounds...it's all about the scenery and hiking or climbing. And there is plenty of both at this National Park. have a life of its own ! wonderful how nature works has made to give the rock structure . @roy: Hi Roy - Thank you very much...Joshua Tree National Park is truly an amazing place to experience. @Tamara: Hi Tamara - Thank you so much! 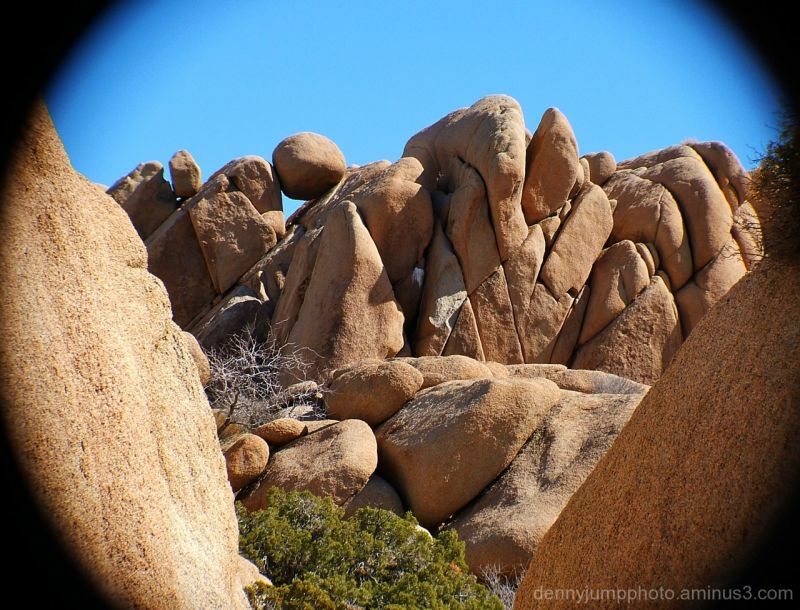 The rocks at "Joshua Tree" are indeed amazing...thanks and I hope you have a wonderful weekend. Barbara and I are taking a 5 mile hike (pretty easy one really) tomorrow! Great landscape... just wondering why you'd choose to use the vignetting here in such a strong way? Also, how would this pic look in back and white? @john4jack: Hi Jack - Thank you very much sir! Have a wonderful weekend! Excellent rock formations! You did a good job capturing this. WOw - this looks alive! really! Great shot - just beautiful! Nice shot of these rocks. Excellent capture of the rocks Denny! @Bill Brown: Hi Bill - Thank you...I just found an image copy that has no vignette so next time I will not include the vignette..
Nice shot but I prefer the previous posts - sorry ! Well Denny, I know you want my honest opinion, so I will just tell you that I personally don't care for vignettes. However, I also read your reply to Bishop and understand why you would have to use it. As for color vs black and white-I vote for color! I like the detail on the rocks and the bright blue sky. Am I correct in assuming this is sandstone? @Julie Brown: Again no problem Julie - I understand Bishop'e and your comments...so I went back into the "archives and I DID find an "UN-vignetted" version...so next time there we go ;-) ...as for the B&W I appreciate that vote as well . AS for teh rocks, believe it or not they are a type of granite called monzogranite..I always thought it was sandstone as well but when I was "reading up" on this stuff, I learned that it is that type of granite that is very much like sandstone in appearance but indeed it s a type of granite. Cheers! Almost like peeking through a keyhole! Very nice indeed my friend! Love your treatment here. Viewing through a looking glass. Beautiful color and texture captured in the rock. And your vignetting does a great job of focusing attention, as if "eyeing" something through a periscope. @Steven: Hi Steven - Thanks very much./ This one illicited some strong responses one way or the other..thank you very much for yours! Cheers!